The suit claims the manufacturer, Promotion In Motion (really, crappy snack-food company? That’s the rhyme you went with? ), falsely advertised the little Day-Glo nightmares as possessing “significant amounts of the actual fruits shown in the marketing and on the labeling of the product, were nutritious and healthful to consume, and were more healthful than similar products.” The company declined an interview but released a statement saying, “Our labeling is truthful and gives consumers the information they need to make informed decisions.” Indeed, it’s tough to see how anyone could’ve mistaken the advertising as suggesting there’s something healthy going on here. 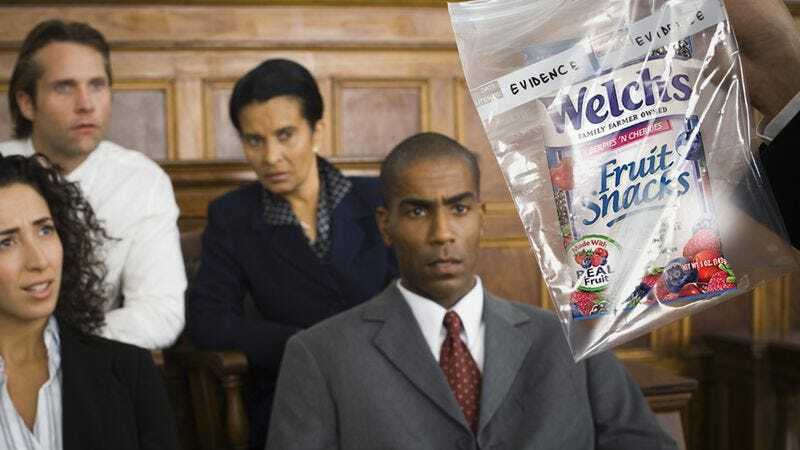 In a nice and succinct breakdown of the case, io9 points out the lawsuit essentially hinges on what’s commonly known as the federal “jelly bean rule,” which basically says that producers can’t sneak junk food into the healthy category just by including some vitamin additives. It’s a rule the makers of Vitaminwater know all too well. But until that time, Promotion In Motion will continue to package what are basically Dots with a healthier-sounding name and sell them as a supposedly sensible part of the lunch you pack for your kids. Presumably, this lawsuit gives pause to any plans on the part of Jim Beam to move forward with its “A healthier way to get to sleep!” campaign.